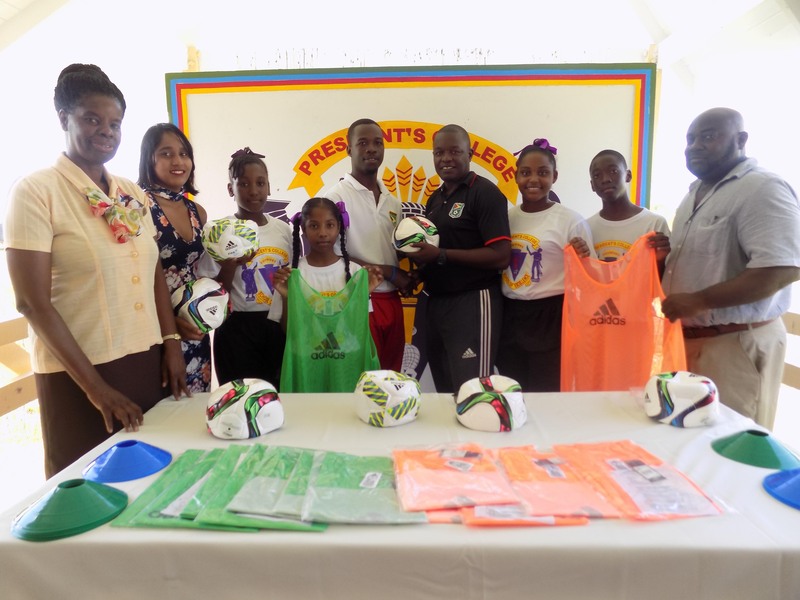 In an effort to develop the sport at the school level, local governing body, the Guyana Football Federation (GFF), donated several pieces of equipment to the President’s College Football Programme. According to a release from the entity, the presentation, which occurred yesterday, was made to the school’s Physical Education Teacher Willon Cameron by GFF’S Youth Development Officer (YDO) Bryan Joseph. President’s College Physical Education Teacher Willon Cameron collects the donation in the presence of students and staff of the school from GFF’S Youth Development Officer (YDO) Bryan Joseph (fourth from right). “The presentation consisted seven footballs, 16 bibs and 20 flat markers and was made to the project facilitated by the school’s Alumni,” the release stated.